How can I print a copy of my paid invoice(s)? Invoices are automatically mailed to member email address when registering and again when payment is received. However, if you need to view and/or print an invoice associated with your personal account then follow these directions. Scroll to the event/invoice you need and click to print. Step 5: Click the payment option you wish to use to pay the invoice. A confirmation email will be sent to you once the payment is received. My agency needs to pay multiple invoices, how do I proceed? Upon registering members are automatically emailed confirmation of registration with a link on the invoice to pay on-line or print the invoice if paying by check. 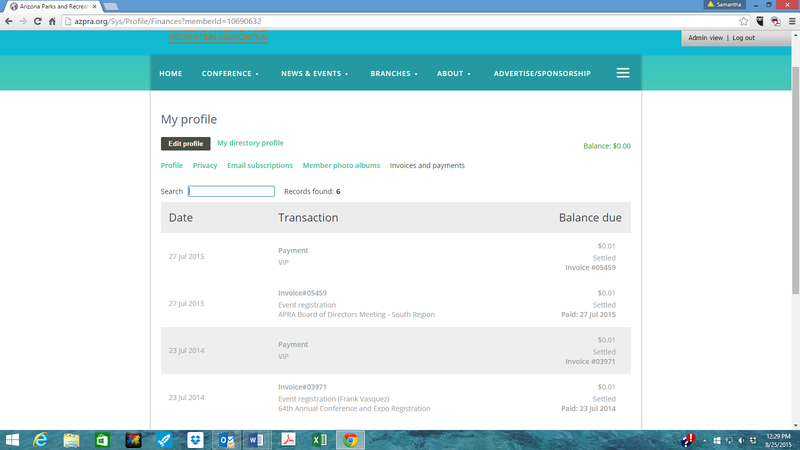 The member is also able to print an invoice directly from their account if needed. If paying by check for multiple individual members, have each member print any outstanding invoices and the agency can mail in one check for multiple outstanding invoices. Please be sure that the individual invoice numbers are included with the check so the office can credit the proper accounts. Can I register without paying if my agency will be mailing a check? Yes, members in good standing are given the option to complete the registration process without paying at the time of registration by clicking the pay with a PO, if that option is available. Not all event registrations allow this option. An approved Purchase Order can be used to hold space for event until payment has been received in the office, a PO is not considered a form of payment. You will need to email a copy of the approved PO to the APRA office. If materials need to be sent for a specific class they will not be sent until the office receives the check or confirmation of an on-line payment has been received. If you are required to submit an invoice for the program before a PO will be approved, go ahead and register for the program and a copy of the registration will be sent to your email address, print a copy of this email and submit with the PO. Then email a copy of the approved PO to the APRA office. You are not officially enrolled into a class until payment is received. If payment has not been made prior to the registration cut off date the office reserves the right to cancel your registration. Can my agency pay with a check?